Do you want to create your own LUT's? You can with a LUT generator and it's much easier than you think. I have been talking a lot recently about the technique of Color Grading and how this can be used in Landscape Photography. In this article I want explain how to create your own LUTs using a LUT generator. Although, as I demonstrated in one of my Youtube videos, you can create your own LUT’s in Photoshop, the process is a little limiting. If you want complete freedom over LUT creation you need a good LUT generator. In my research, I found the best combination of price, features and ease of use was “3D LUT Creator” which I’m going to explain here. I've also created this short video to demonstrate how easy it is to use the software. 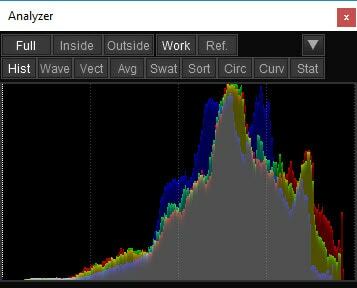 Here you can see the 3D LUT Creator interface with the starting image open. On the left side of the interface, surrounded by the red box are the editing tools. The editing tool shown in the illustration is the “A/B Grid” which is very intuitive and powerful. You can see the “A/B” title indicated by the small red arrow and there are other tools on this menu. 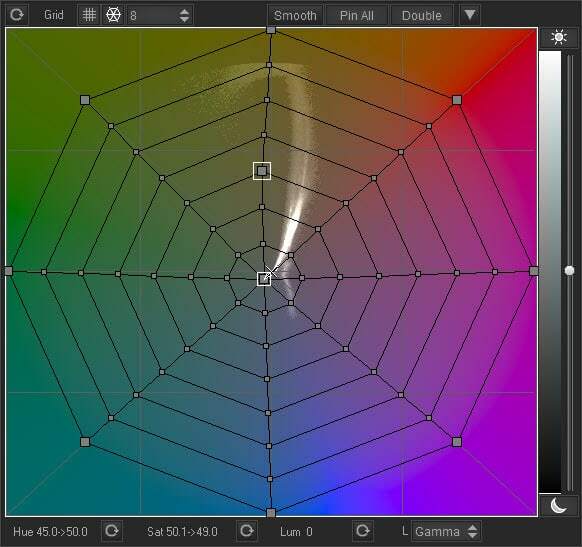 The grid itself looks like a spider’s web and provides control over the colours in the image. Below this you have the more traditional, slider-based tools that most photographers are familiar with. Separately, there is a small Analyser floating window that displays helpful information. You can see an example of this below. Examining the image being edited, it would benefit from being a little warmer, more saturated and possibly a little brighter. I would also like the warm tones in the top right to appear more golden. Contrast = 20 – I was expecting to push the histogram out at either end when increasing the Contrast. This doesn’t seem to happen. Increasing the contrast moved the midtones and shadows towards the highlights. Based on the visual result I increased the contrast. Pivot = 30 – I can though see the default is 50 and reducing this appears to compress the histogram into the highlights area for this image without causing blown highlights. 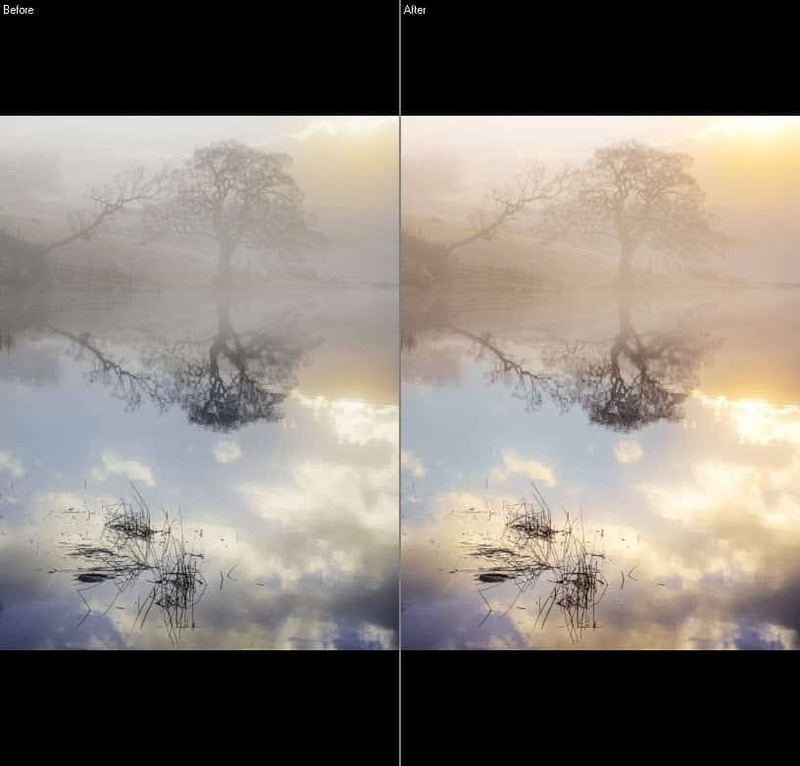 Dynamic Range = 10 – This adjustment limits highlight clipping in the very brightest areas where the sun is breaking through the mist. Move the slider in the opposite direction and it limits how bright the white areas appear. Examining the image, there is a colour shift in the blues which appear slightly purple. We can correct this using the spiders web grid. The adjustments targeted the blues in the image, moving them towards blue/green or teal. If you make a mistake and want to reset the grid, use the reset icon top left. Clicking this resets the grid to the original position. If you want to undo a single change to the grid, use the “Edit | Undo” option in the menu. You can work back through the history of changes with this. This LUT generator also features a much more intuitive way to make your adjustments. By clicking a point on the image, you can adjust the grid by dragging left, right, up and down. As you click and drag, you see the corresponding colour points on the grid move. Clicking the blue area in the centre of the frame and dragging left/down, corrects the purple hue in the blue. It’s then possible to make the sky more golden by clicking and dragging left/up. To show you how small the adjustments to the grid were, here is a closeup of the grid. Having corrected the colours in the image it was possible to increase the Temp slider further, to a value of 15. After this, click the “Smooth” button. 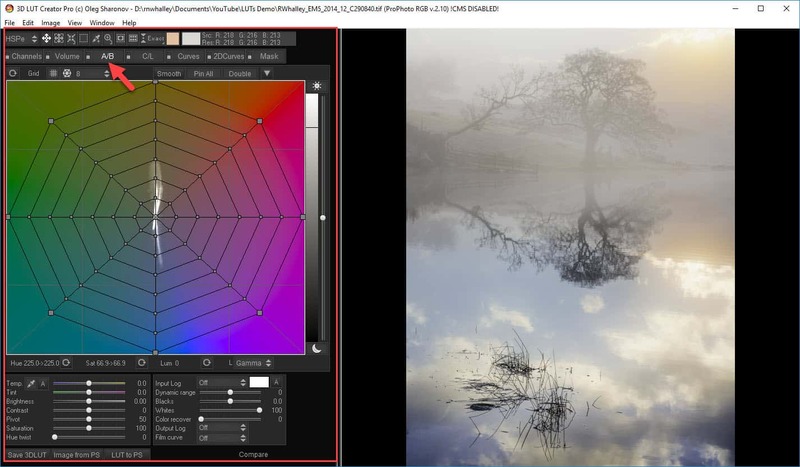 This makes adjustments to the grid to smooth out the image tones. Here is the finished side by side image. If you want to create a LUT file using the adjustments applied to the image you can select “File | Export” to export it ready for use. Several LUT formats are supported including “cube”, so you should find a lot of compatibility. 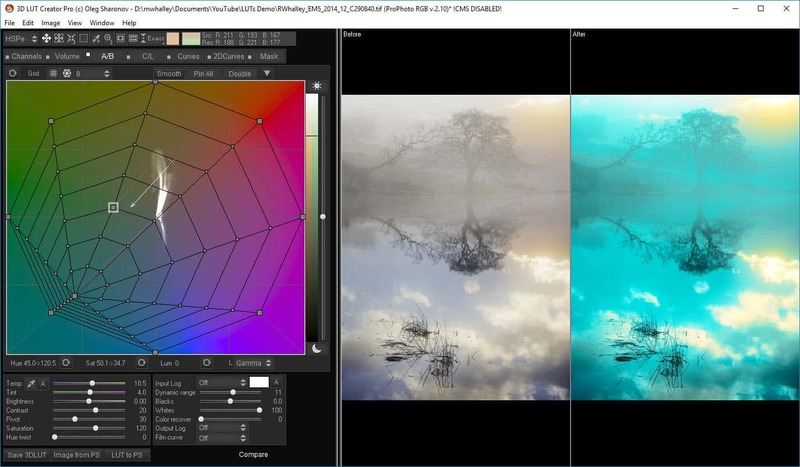 There is even an option to export and install the LUT directly to Photoshop. If you want to find out more information about using 3D LUT Creator I would recommend the tutorials on the 3D LUT Creator website. This is a very useful LUT generator that produces professional results at an affordable price.